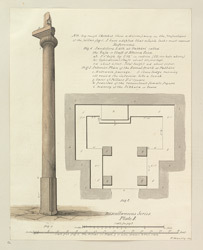 Pen and ink and wash drawing by Frederick Charles Maisey, of a sandstone pillar at Pathari, from an album of 60 drawings, dated 1847-1854. In the 'Descriptive list of drawings of Captain Maisey' the artist wrote, "Pathari is a straggling, ruined town, situated along a low ridge, about 10 miles N.E from Udaipur…The“Gaja”, or pillar of Bhimasena, commonly called “Bhima Gaja” or Bhima staff...stands a little within the town, and is a fine pillar about 40 feet high, and apparently formed of a single block of sandstone (fig.1 Plate 8): it has no base; the shaft is of square section (with notched or indented angles), to a height of 8 feet 1 inch, and thence cylindrical…The capital consists of a ribbed or fluted torus, resembling the “kalas” of Hindu temples, surmounted by a massive abacus with three fillets:: the summit is occupied by the fragment of a standing figure, which goes by the name of the Pandava Bhima Sena, who is said to have erected the pillar in commemoration of an Ashvamedha [horse sacrifice]...which he celebrated here after a victory. At the foot of the pillar lies a large stone slab carved on one side, which is said to have once crowned the summit of the pillar, to have been dislodged by lightning…At one side of the square portion of the shaft is a long Sanskrit inscription…We thus may suppose the pillar to have been erected some time in the 5th century AD. The presence of a Gupta inscription is however, no proof, in itself, of the equally modern date of the pillar…The next ruin I visited is at some distance from the town…This is a large Temple, with several surrounding buildings, called the “Garhal Marh”, or Herdsman’s Temple, after its reputed founder…The building seems very ancient, and appears to have been frequently repaired…As far as I could judge, there were 6 small temples, arranged round the central one, and connected by passages with the main structure…This collection of temples stands on a raised basement of some extent, in the center of a quadrangular enclosure: there are two gateways, one in the outer wall, and the other leading on to the raised basement… The plan inside is as shown in fig.2 Plate 8…The walls are plain, but have a deep cut cornice supported by four carved pillars, a projecting ledge, like a bench, runs round the interior".